Swarmthe is a useful tool for browsing the web, not searching it. You need to come here with an open mind and you may find some really cool stuff. 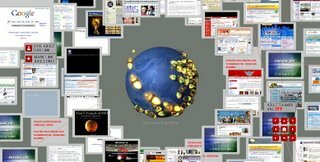 Swarmthe is a graphical map of hundreds of websites, all connecting to each other. It updates itself every second with where people are going and coming from. As sites become more popular, they move towards the center of the swarm and grow larger. Conversely, sites that lose traffic move away from the center and grow smaller. Swarmthe allows you to chat about any link you see. When you see a little chat icon flash, it means people are actively chatting about that link. Does it cool?